ST.PETERSBURG, April 10. /TASS/. Russia is interested in expanding military and technical cooperation with other countries and is ready to consider plans on signing new contracts on delivering S-400 missile defense system to Turkey, Kremlin Spokesman Dmitry Peskov told reporters. "Russia is open, Russia has certain capabilities and technological competence. Of course, Russia is looking for the opportunities to expand this cooperation. 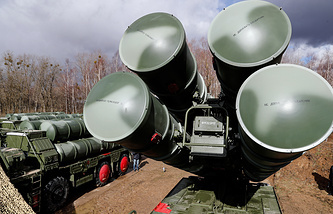 This is absolutely normal practice," Peskov said, answering a question whether Moscow was ready to discuss with Ankara a new deal on the S-400. Earlier on Wednesday, Turkish Foreign Minister Mevlut Cavusoglu told NTV channel said Turkey could sign another deal with Russia on S-400 missile system deliveries if the United States refused to supply Patriot air defense system to Ankara. The Kremlin spokesman emphasized that military and technical cooperation is a very important area of Russia’s cooperation and interaction with many countries. "The implementation of this cooperation signals a special level of bilateral relations’ development. This also refers to Turkey," he pointed out. The news about the Russian-Turkish talks on the purchase of S-400 systems first came in November 2016. Moscow confirmed that the contract had been signed on September 12, 2017. Turkish President Recep Tayyip Erdogan announced that Ankara had made an advance payment. The United States has been taking vigorous efforts to prevent Turkey from purchasing Russia’s S-400 air defense systems.